They aren’t exactly doing hand-stands at the Telegraph over the performance of their metered paywall one year on. But I’m told that the revenue it has brought in is significant, without harming the proposition for advertisers. The results are, so far, they say "encouraging". 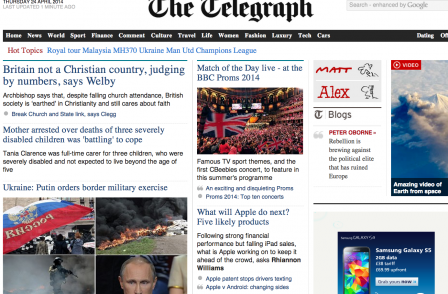 The ABC figures suggest the paywall has slowed, but not stopped, the rate of website traffic growth for the Telegraph. The graph below compares average daily unique browsers for the Telegraph and The Guardian over the last two years. The Telegraph limited free access to 20 articles per month for foreign readers in November 2012 and then for all readers in April 2013 with the basic online subscription set at a modest £1.99 per month. The metered paywall has proved to be a silver bullet for the New York Times, the Financial Times and for Andrew Sullivan's US-based blog The Dish. We aren't there yet with the Telegraph, but it is also too early to write it off. Let's remember that the Telegraph has had its distractions over the last year. In March 2013 it announced the axing of 80 jobs, the creation of 50 new digital roles and a restructure which saw the Daily and Sunday Telegraph editors placed underneath a new director of content. Then there was the long process of recruiting a permanent chief content officer. Digital guru Jason Seiken began full-time in that role at the end of November, dispensing with Daily Telegraph editor Tony Gallagher shortly afterwards. Then, in February, Seiken announced sweeping changes to his senior team. So I suspect hard numbers on the paywall will have to wait until the new regime has fully settled in at Telegraph towers. But to find out if a metered paywall can work for a mainstream UK news website the Telegraph may need to tighten up its current 20-article limit. The New York Times began metered website access three years ago with 20 free articles a month. Since then it has reduced the limit to ten and worked hard to clamp down on loopholes in the system. It now has more than 760,000 digital subscribers, but unlike the Telegraph it does not have to contend with the BBC. The Financial Times pioneered a metered paywall in 2007 when it offered 30 free articles free a month. Since then the limit has been cut as low as seven (it now stands at eight) and the FT website is a huge success with more than 415,000 digital subscribers. The question is that with the advertising market recovering does the Telegraph want to limit free access further? Last month saw a return to stronger growth for Telegraph.co.uk as unique 'browsers' for the month rose 24 per cent to 72m according to ABC. 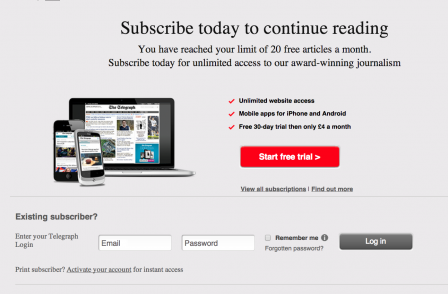 Metered paywalls may still prove to be the answer for general news websites in the UK. I hope they are, because digital advertising on its own is still a long way from supporting national newspaper size journalism operations.